Listen to the podcast. Find it on iTunes/iPod. Read a full transcript or download a copy. Sponsor: VMware. 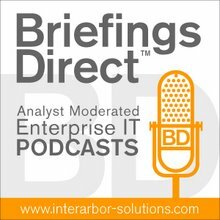 The latest BriefingsDirect enterprise user IT adoption story centers on how global legal services leader Foley & Lardner LLP has adopted virtual desktops and bring-your-own-device (BYOD) to enhance end-user productivity across their far-flung operations. Gardner: What was "the elephant in the room," when it came to the old way of doing client-side computing? Was there something major that you needed to overcome? Sanders: Yes, we had to have a reduction in our technology staffing, and because of that, we just didn't have the same number of technicians in the local offices to deal with PCs, laptops, re-imaging, and lease returns -- the standard things that we had done in the past. We needed to look at new ways of doing things, where we could reduce the tech touches, as we call it, and find a different way to provide a desktop to people in a fast, new way. Varju: From a technical perspective, we were looking for ways to manage the desktop side of our business better, more efficiently, and more effectively. Being able to do that out of our centralized data center made a lot of sense for us. Other benefits have come along with the centralized data center that weren't necessarily on our radar initially, and that has really helped to improve efficiencies and productivity in several ways. Gardner: Tell us about your organization at Foley. Linda, how big are you, where do you do business? Sanders: Foley has approximately 900 attorneys and another 1,200 support personnel. We're in 18 U.S. offices, where we support virtualized desktops. We have another three international offices. At this time, we're not doing virtualized desktops there, but it is in our future. Gardner: Rick, how has virtual desktop infrastructure (VDI) been an enabler? Varju: The real underlying benefit is being able to securely deliver the desktop as a service (DaaS). We are no longer tied to a physical desktop and that means you can now connect to that s ame desktop experience, wherever you are, anytime, from any device, not just to have that easy access, but to make it secure by delivering the desktop from within the secure confines of our data center. That's what's behind deploying VDI and embracing BYOD at the same time. You get that additional security that wouldn't otherwise be there, if you had to have all your applications and all data reside on that endpoint device that you no longer have control over. With VMware View and delivering the DaaS from the data center, very little information has to go back to the endpoint device now, and that's a great model for our BYOD initiatives. In terms of raw numbers, every attorney in the firm has a mobile device. The firm provides a BlackBerry as part of our standard practice and then we have users who now are bringing in their own equipment. So at least 900 attorneys are taking advantage of mobility connectivity, and most of those attorneys have laptops, whether they are firm issued or BYOD. Easily 1,500 personnel taking advantage of some sort of connectivity to the firm through their mobile devices. Gardner: So as IT and business management, you get a better control and a sense of security, and the users get choice and flexibility? Sanders: That's correct. Before, we were selecting the equipment, providing that equipment to people, and over and over again, we started to hear that that's not what they wanted. They w anted to select the machine, whether it be a PC, a Mac, an iPad, or smartphone. And even if we were providing standard equipment, we knew that people were bringing in their own. So formulating a formal BYOD program worked out well for us. In our first year, we had 300 people take advantage of that formal program. This year, to date, we have another 200 who have joined, and we are expecting to add another 100 to that. As Rick mentioned, we did also open this up to some of our senior level administrative management this year and we now have some of those individuals on the program. So that too is helping us, because we don't have to provision and lease that equipment and have our local technology folks get that out to people and be swapping machines. Now, when we're taking away a laptop, for example, we can put a hosted desktop in and have people using VMware View. They're seeing that same desktop, whether they're sitting in the office or using their BYOD device. They're seeing that same desktop, whether they're sitting in the office or using their BYOD device. Gardner: Do you have any metrics in terms of how much this all saved you? Sanders: Over three years, we'll probably be able to reduce our spend by about 22 percent. We had our business manager within technology calculate for us what we were spending year after year on equipment, factoring in how much tech time is involved in that, and coming up with a realistic number, where people could go out and purchase equipment over a three-year time frame. That was the start of it, looking at that breakdown of the internal time, selecting a dollar amount, and then putting together a policy, so that individuals who decided to participate in it would know what the guidelines were. Our regional technology managers met one on one or in small groups with attorneys who wanted to go on the program, went through the program with them, and answered any questions upfront, which I think really served us well. It wasn’t that we just put something out on paper, and people didn’t understand what they were signing up for. Those meetings covered all the high points, let them know that this was personal equipment and that, in the end, they're responsible for it should something happen. That was how we put the program together and how we decided to communicate the information to our attorneys. Gardner: Has something about the DaaS allowed you to extend these benefits beyond just your employees? Is there some aspect of this that helps on that client services equation. That does provide some additional benefit for our attorneys, when it comes to delivering the best possible service we can to our clients. Varju: The ease of mobility and some of the productivity gains make a big difference. The quicker we can get access to people and information for our attorneys, no matter where they are and no matter what the device they're using, is really important today. That does provide some additional benefit for our attorneys, when it comes to delivering the best possible service we can to our clients. One of the things that we're looking at now is unified communications, and trying to pull everything to the desktop, all the experiences together, and one of those important components is collaboration. If we can deliver a tool that will allow attorneys and clients to collaborate on the same document, from within the same desktop view, that would provide tremendous value. There are certainly products out there that will allow you to federate with other organizations. That’s the line of thinking we're looking at now and we'll look to deploy something like that in the near future. Sanders: The biggest plus is, as Rick mentioned, for people who are mobile, is that they have the same desktop, no matter where they are. As I talked about before, whether they're in the office or out of the office, they have the same experience. If we have a building shut down, we are not trapped into not being able to deliver a desktop, because they can’t get into the building and they can’t work inside. They're working from outside and it’s just like they are sitting here. That’s one of the biggest pluses that we've seen and that we hear from people -- just that availability of the desktop. Varju: Before deploying VDI and VMware View, we delivered a more generic desktop for remote access. So to Linda’s point, being able to have your actual desktop follow you around on whatever device you are using is big. Then it's the mobility, even from within the office. When an attorney signs up for the Technology Allowance Program, we provide them a thin client on their desk, which they use when they're sitting in their office. Then, as part of the Technology Allowance Program and Freedom of Choice, they purchase whatever mobility technology suits them and they can use that technology when working out of conference rooms with clients, etc. The ability to move and work within the office, whether in a conference room, in a lobby, you name it, those are powerful features for the attorneys. So remote access and having their own personal desktop follow them around, the ability to move and work within the office, whether in a conference room, in a lobby, you name it, those are powerful features for the attorneys. We're definitely ahead of the curve within the legal vertical. Other verticals have ventured into this. Two in particular have avoided it longer than most, the healthcare and financial industries. But without a doubt, we're ahead of the curve amongst our peers, and there are some real benefits that go along with being early adopters. Gardner: Explain for me, Rick, how you went about architecting this solution, and perhaps a little bit about the journey, and both good and bad experiences there? Varju: We've been virtualizing servers for quite some time now. Our server environment is just over 75 percent virtualized. Because of the success we have had there, and the great support from VMware, we felt that it was a natural fit for us to take a close look at VMware View as a virtual desktop solution. We started our deployment in October of 2009. So we started pretty early, and as is often the case with being an early adopter, you're going to go through some pain being among the first to do what you are doing. In working with our vendor partners, VMware, as well as our storage integrators, what we learned early on is that there wasn’t a lot of real-world experience for us to draw from when designing or laying out the design for the underlying infrastructure. So we did a lot of crawling before we walked, walking before we ran, and a lot of learning as we went. But to VMware’s credit, they have been with us every step of the way and have really taken joint ownership and joint responsibility of this project with Foley. Whenever we have had issues, they have been very quick to address those issues and to work with us. I can't say enough about how important that business relationship is in a project of this magnitude. While there was certainly some pain in the early stages of this project and trying to identify what infrastructure components and capacities needed to be there, VMware as a partner truly did help us get through those, and quite effectively. To VMware’s credit, they have been with us every step of the way and have really taken joint ownership and joint responsibility of this project with Foley. PCoverIP protocol is critical to the overall VDI solution and delivering the DaaS, whether it's inside the Foley organization and the WAN links that we have between our offices, or an attorney who is working from home, a Starbucks or you name it. PCoverIP as a protocol is optimized to work over even the lowest of bandwidth connections. The fact that you're just sending changes to screens really does optimize that communication. So the end result is that you get a better user experience with less bandwidth consumption. Sanders: The success that we've had, as we have spoken about throughout this call, has been the ability to deliver that desktop and to have attorneys speak to their peers and let them know. Many times, we have attorneys stop us in the hallway to find out how they too can get on a hosted desktop. Leveraging with the BYOD program helped us, giving people that freedom of choice, and then providing them with a work desktop that they can access from wherever. We're really looking at unified communications. One of the things that I'm very interested in is video at the desktop. It's something that I am going to be looking at, because we use video conferencing extensively here, and people really like that video connection. They want to be able to do video conferencing from wherever they are, whether it's in a conference room, outside the office, on their laptop, on a smartphone. Bringing in that unified communication is going to be one of the next things we're going to focus on. Any time we look at a change in technology, especially the underlying infrastructure, we always take a look at what cloud services are available and have to offer. Varju: Cloud computing is certainly an interesting topic and one that you can spend a day on, in and of itself. At Foley, any time we look at a change in technology, especially the underlying infrastructure, we always take a look at what cloud services are available and have to offer, because it's important for us to keep our eye on that. There is another area where Foley is doing things differently than a lot of our peers, and that's in the area of document management. We're using a cloud-based service for document management now. Where VMware View and VMware, as an organization, will benefit Foley as we move forward is probably more along the lines of the Horizon product, where we can pull our SaaS-based applications or on-premise based applications all together in a single portal. It all looks the same to our users, it all opens and functions just as easily, while also being able to deliver single sign-on and two-factor authentication. Just pulling the whole desktop together that way is going to be real beneficial. Virtualizing the desktop, virtualizing our servers, those are key points in getting us to that destination. I want to thank you for providing this useful information about web services!